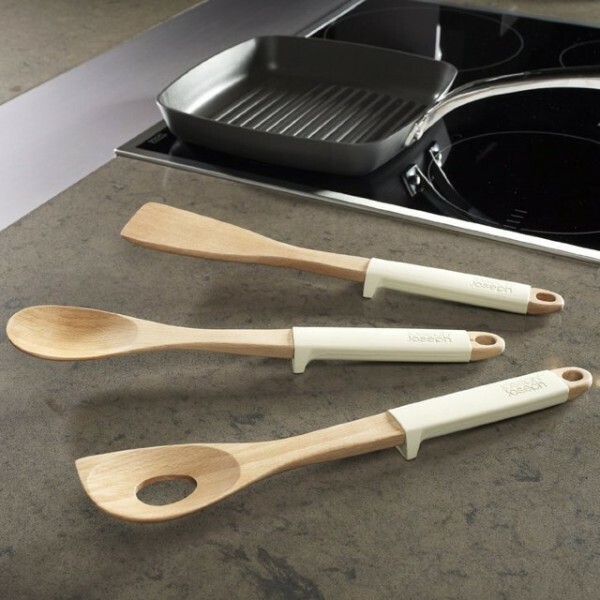 What It Is: A set of wooden spoons from kitchen gadget innovators Joseph Joseph. The twist? They have a weighted handle and a small ramp that keeps them from touching your (potentially dirty) kitchen counters. Perfect for when you need to take a break from stirring that pasta sauce! Available in a regular spoon, batter spoon, and turner. Who It’s For: Your slightly gross little brother who just moved out, so his food isn’t compromised by his dirty countertops. Your kitchen gadget loving mom, as a nifty stocking stuffer. Your favourite hostess, as a unique dinner party gift she’ll actually use. What It Costs: The spoons retail for about $16 each. Where It’s At: Le Tablier Blanc. Bonus entry into this month’s Find of the Month Opelle giveaway – what do you think of this smart spoons? Would you buy them as a gift? I love these, would definitely buy as gifts. Think I need a set too! I think these spoons are really great. Not only would I buy them as gifts, I would buy a set for myself too! What a great idea! I would buy these as housewarming gifts and a set for myself. Opelle bonus entry: I like these smart spoons & would definitely consider them as a wonderful (housewarming) gift. These spoons are a great idea and would be a great housewarming gift. I would not buy them for myself as I just use a plate to set my utensils I am using to cook. I would love these for me, as well as for stocking stuffers & hostess gifts. I would love these as gifts for others and myself! I don’t understand why someone didn’t think of this sooner – sure I’d buy it as a gift. Absolutely I would buy these as a gift! Ingenious! the ramp is such a good idea; these would make great gifts! These would make a great gift for a housewarming. I love the idea! A great idea but I wouldn’t spend that much for them. Great hostess gift, love them, although a little pricey. A great gift, but I wouldn’t use them myself (they are a bit pricey). I already have a spoon rest. I love these! I would definitely buy them as a gift and for myself. This would be a nice, different hostess gift. These are such a cute idea! I would definitely gift these! I’d buy these as a gift, and I’d also get a set for myself. Good idea for any household. I think these spoons are great! Always pulling out an extra dish in order to keep the counter clean. This is easier!